In January, I received $346.55 in dividend income. Okay, so I didn’t beat Lanny. In fact, he doubled me up for the month. But I at least kept you all in suspense for a few seconds, right? However, despite that, I was pretty excited to see my dividend income increase 149% compared to last year. Here is a detailed chart explaining my dividend income (The W represents dividend income received by my wife). The impact of my fourth quarter stock purchases was really felt. When the market fell in the fourth quarter, I built a strong IRM position in my wife’s Roth IRA and added to my positions of ITW and LEG. Those companies were three of my six largest dividend contributors during the month. It took me a while to finally receive the dividends from these purchases. But man did they pack a punch once they arrived. I was aided by the fact that Pepsi pays one of their dividends in January (the first month of the quarter) rather than the regular third quarter of the month. Since I purchased Pepsi last year in the second quarter, I didn’t realize this happens. This is awesome for January, but will hurt come April when my dividend income decreases during that month. But today, I’m pretty excited about it! NGG was purchased back in September. The company only pays their dividend semi-annually and this is the first payment I received from them. A nice $41 payment to start it out. The last comment is something that was pretty cool for my dividend income. Realty Income was one of my lowest paying dividend companies for the month. At $20 received this month, that’s a pretty decent chunk of change! So it was nice to see that dollar amount on the bottom of my chart, rather than the top! We love dividend increases on this site. In fact, I talked about them monthly in my “Expected Dividend Income” series. The first quarter always has a lot of dividend increases. I was fortunate to receive 5 dividend increase this month and add over $23 to my dividend income as a result. There weren’t any large, surprising dividend increases. However, they were all pretty solid. NSC led the pack with a 7.50% dividend increase and I think they are setting themselves up for a second dividend increase later on in the year once again. This second table shows the additional dividend increase received from purchases and 401(k) contributions. I kept my stock purchases simple this month by only purchasing two stocks this month., Dominion and Abbvie. In fact, I already owned both of those stocks; so there were no new companies added to my portfolio in January. I actually purchased ABBV multiple times, as their price continued to decline, falling below $80/share for a period of time towards the end of the month. The reason my mutual fund was larger than my wife’s is due to the fact that my company pays us every two weeks. January was one of those months where we happened to receive 3 paychecks. Accordingly, I received 3 401(k) contributions. Another item to note is that once again, I did not receive any new shares in my HSA. I wrote about how I am consolidating HSA accounts during the month. Once consolidated, I will have over $1,000 in my new account and each new contribution will become invested again. Read more about this here! All in all, purchases and contributions added $253.72 in dividend income. In total, that’s over $276 in dividend income from these two avenues! Welp, another month has breezed by. Time continues to fly by and I don’t know where it is going. It is truly insane, if you ask me. But with time passing by, we continue to have a chance to monitor our progress and growth over the years. For Lanny, he absolutely crushed it, as I mentioned earlier. Each month, we cover and show how all of YOU continue to crush it as well. Your growth and progress is truly inspiring and I’m happy to have embarked on this journey with all of you. I’m going to enjoy this 100%+ YOY increase, but I know that’s not the norm and it will eventually revert closer to the average. But 2019 should be a fun year for so many different reasons. So lets crush it, conquer it, and make every freaking dollar count. Let’s do this! How were your months? What was your dividend growth rate? What stocks did you purchase this month? How many extra dollars did dividend increases add to your forward dividend income? This entry was posted in Monthly Summary and tagged Dividend Growth Rate, Financial freedom, personal finance, Stocks. Bookmark the permalink. Great start to the year. Its amazing looking back how small our numbers were, and how big they are starting to look now. Thank you very much! Time is the best friend for a dividend growth investor and the fruits of our labor are starting to pay-off, that’s for sure. Super Bowl was OK. For me it was just about watching a football game, pizza, chips and hanging with family like we do every year. Congrats on an awesome start to 2019. Not that I’m looking to add new names anytime soon but I wouldn’t mind seeing LEG or CM in my portfolio one day too. Here’s to a strong ’19! Yes, it more about the atmosphere than the game itself. I love that tradition. In the past, my friends and I got together for the game and it was a blast. This year, it was my wife and I and we made some random foods and relaxing. It was a blast! 2019 is going to be a great year and crush it for us. LEG’s price has really bounced back from being stuck in the $30s, but the yield is still great. Great month…way to go Bert! Best wishes to you as well. Congrats on crossing the $500 mark. That’s an awesome threshold to hit right and the MO purchase will continue to fuel that strong dividend growth rate. Nice work Bert – way to start the year of with some sweet year over year gains. Your comment on Realty Income (O) reminded me that I noticed O hit a 52 week high this week at over $70/sh. Since it is a well run company with monthly dividend income and consistent dividend raises, it is no surprise that it has generally traded at a premium valuation compared to other similar REITs, but I was surprised to see it as high it has been lately. I am guessing it is partly driven by the dovish tone the Fed set recently regarding their previously planned rate hike schedule. Realty Income is one of my favorite holdings. I would agree and yes, the Fed’s dovish tone and decreasing interest rates are benefiting the well run REITs. But even when rates were increasing in December, their price didn’t decrease significantly. I’ll hopefully be able to add one day, but I’m happy to see the company doing so well. Awesome month Beat! We ended up with right around the same amount as you but we beat you with a 6th increase in January! I’ve made 2 purchases so far in February but went with 2 starter positions because I think one is pretty cheap and the other is a little below to right around fair value. Hoping to add more of both on any future dips. All the best in February and can’t wait to see how we all do. Over 100% increase over last year? That’s a win! The superbowl was a little boring unfortunately. Keep those dividends rolling in, great to see. Congrats on a solid start to the new year Bert. You didn’t beat Lanny but 149% increase from last year is just awesome!!! That is a massive yr over yr growth rate. All those raises and new buys should ensure next yr comes with the same result. Thank you. Hopefully that is the case for all of us, as we continue pushing forward with our dividend income and portfolios! You’re off to a great start of the year! Solid work. My month was also pretty good, as I managed to double my dividends compared to last year. The numbers are small compared to yours, though. And I added $33 to my forward income by purchasing some shares of TGT – a new addition to my portfolio. I have to be careful competing with Lanny, or else I will be crushing for a beat down. The only place I can beat him is on the basketball court (Couldn’t resist. He’s much better than me, I just wanted him to see this comment). Congrats on the successful month yourself. The dollar amounts don’t matter. They grow over time. What’s important is that you are putting in the hard work, making purchases when you can, and seeing your income grow. That’s the name of the game right there. Super Bowl was so boring, it was almost not worth it for Europeans to stay up the whole night! You made a smart move to use the time and write the January summary. Although 150% YOY growth is going to be very difficult to come close to duplicating, it’s still a monumental achievement and boost to dividend income. Keep the dividend snowball rolling, my friend! Look at those new dividend payers move to the top of this month’s dividend list! Outstanding, Bert. It’s like your portfolio got one of those makeovers. I can’t believe you put up almost 150% YoY growth! Future months look good as well thanks to that additional forward dividend income you added… Wow, over $275. Keep it rolling. Wow Bert, congrats on that 149% YoY! That is fantastic! 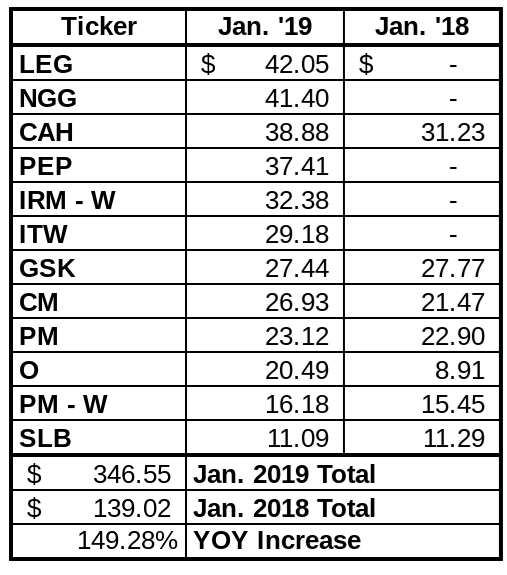 I had $37.97 in January for an increase of 110%, so not quite up to you, but I’ll take it 😛 I like the NGG dividend, as wel las the ABBV and D purchases. I am trying to build my position in utilities right now, and AEP and D are both on my radar. Congrats on your January, and the first month of 2019, and keep pushing forward! Awesome results Bert! That YoY growth is amazing but I think I like the 5 new dividend payers even more, as that is an impressive amount of new money that will be rolling in like clockwork. It looks like I’m an outlier and thought the SB was actually exciting. I like defensive battles and would prefer that over a one-sided blowout. To me, the most disappointing part was the commercials, as I didn’t think there were any really good ones. You’re off to an amazing start. It’s great to see that we share no less then 5 companies this month including LEG a newcomer for me.